BLACK+DECKER's latest edition of the best-selling home-improvement book in North America for more than a decade is completely updated to conform to 2017-2020 national electrical codes. For more than ten years, BLACK+DECKER The Complete Guide to Wiring has been the best-selling home wiring manual in North America. Now with more than two million copies in print, this is the home reference book more DIYers choose than any other for many reasons. As the most current wiring book on the market, you can be confident that your projects will meet national writing codes. You'll also spend more time on your project and less time scratching your head thanks to more than 800 clear color photos and over 40 diagrams that show you exactly what you need to know about home electrical service; all the most common circuits, all the most-needed techniques, all the most essential tools and materials. The information in this book has been created and reviewed by professional electricians under the watchful eye of the experts at BLACK+DECKER. 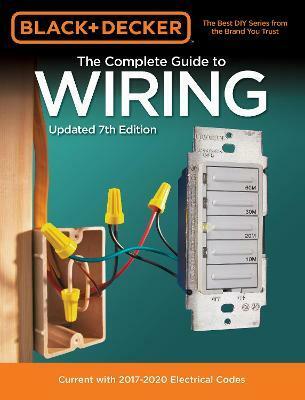 You can find plenty of articles and videos about wiring online or in other publications, but only The Complete Guide to Wiring has passed the rigorous test to make it part of The Best DIY Series from the Brand You Trust.